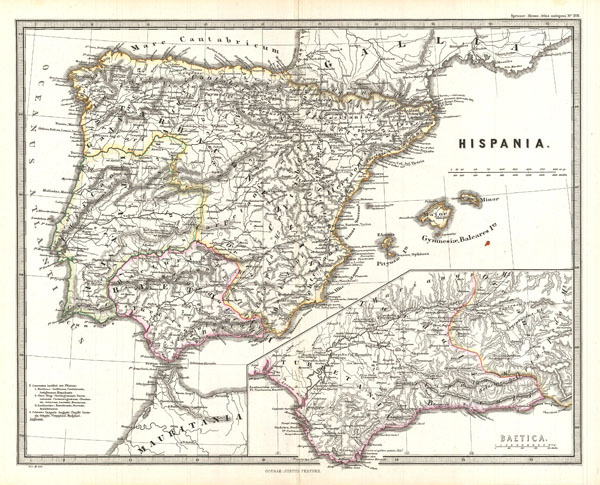 This is Karl von Spruner's 1865 map of Hispania (modern day Spain and Portugal). Under the Roman Republic, Hispania or Iberia was divided into two provinces: Hispania Citerior and Hispania Ulterior –both of which are noted here. Later, during the Roman Principate, Hispania Ulterior was divided into two new provinces, Baetica and Lusitania, while Hispania Citerior was renamed Tarraconensis, which is illustrated on this map. Spruner also includes a detailed inset, showing Hispania Baetica (modern day Andalucía), one of three Imperial Roman provinces in Hispania, (modern Iberia). Hispania Baetica was bordered to the west by Lusitania, and to the northeast by Hispania Tarraconensis. Shows names of ancient tribes and peoples and the areas they inhabited. Map includes a scale and a legend in the upper-left quadrant. Map notes important cities, rivers, mountain ranges and other minor topographical detail. Territories and countries outlined in color. The whole is rendered in finely engraved detail exhibiting throughout the fine craftsmanship of the Perthes firm. Rumsey 1626.017. Phillips (atlases) 3288. Espenhorst, J., Petermann's Planet, p. 397-404. Espenhorst, J., Andree, Stieler, Meyer & Co., p. 148.